Need a quick gift for a little girl in your life? This might = be the perfect thing! Whip one up in a couple hours while listening to an ebook or spending time with your family, add a flower or other embellishment, and you’re good to go! 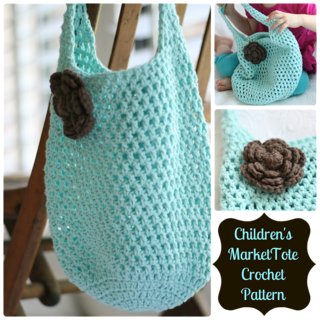 How cute would it be to add some felt or crocheted food inside the bag? Riley has already spent a good deal of time enjoying this bag and I know she would absolutely love having items to go in it! It would also make a good yarn storage bag - it holds a good number of cotton skeins. The finished dimensions of this bag are approximately 12 inches deep by 11 inches wide with a 9 inch “deep” handle (though that’s easily adjustable). I have plans for two more sizes which I’ll hopefully be working on next week.